You Need a JAVA Browser To See The Animation! We had/have a bunch o' turtles. One was eaten by a bassett hound and the other one is a pork chop swimming around somewhere else. 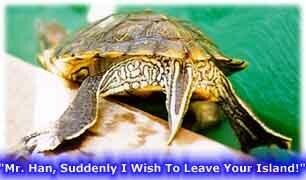 Currently, we are caring for three turtles in two separate tanks. is The Mother of All Turtles. Daily Steroid Injection Seem to Work. She can be seen torturing Chicken by either slapping him upside his nappy ol' head or slamming his head onto the ground during feeding. Whatever the case Chicken really doesn't seem to mind. Anyways, Snot lets Chicken climb on top of her when they are on land so he can get closer to the heat lamp. No Pictures of Turkey or Pork Chop. We also don't have X-Rays of the bassett hound. 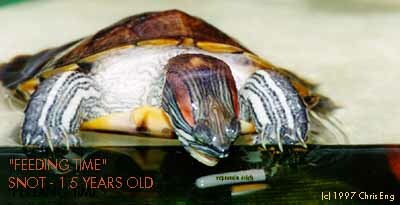 is a dude, might of had some health problems when he was hatchling since his skin is very pale and wrinkled. He also has very weak eyesight. You really need to stick the food up his nose before he gets the idea. 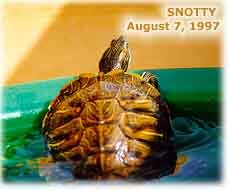 He is much smaller than Snot. 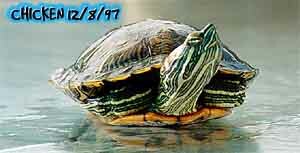 All the turtles are the same age, but as a male he is smaller and dominated by the female. He follows Snot around everywhere like a lost puppy and never lets up, it really is cute. Snot does mind and shows her respect by sitting on top of Chicken. Chicken hasn't drowned yet so all is good. is in a separate aquarium. She used to hang out with Chicken, but he got a little rough and started biting Chicken's toes. 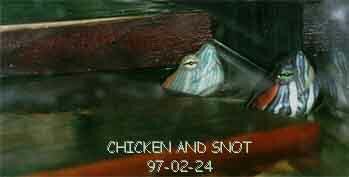 He is violent towards Chicken, and tried to be with Snot, but Snot just sits on him and slaps him around too. Turkey, as a hatchling was very sick and had respiratory problems, but she came out like a trooper. Turkey's eyesight is good, but she is a bit cross-eyed. In early May, CHICKEN and SNOT moved outside. They said Summer was coming and they wanted to get in a lot of sunbathing this season, so I obliged. Their new house is a four foot diameter turtle shaped sandbox that holds about 25 gallons. Accomodations are complete with a Fluval 4 submersible filter, Ebo-Jager 150 Watt heater and various pine planks. Snot and Chicken, now acclimated to their summer dwelling, wake up each morning at dusk eagerly awaiting the first rays of sunlight. 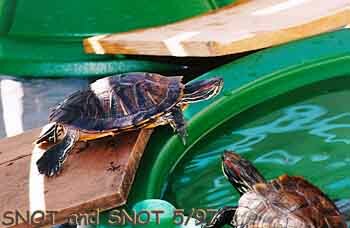 Tired of teetering on their basking spot on the edge of their pool,. 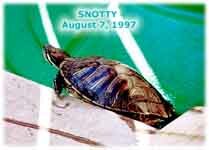 Snot is the first to crawl out and chase the sun. Chicken, always skittish, waits until Snot is situated in a good spot and then follows suit. Over these past two months, Chicken's shell has changed from light-blue to a more natural darker color, which can be attributed to the rays of the sun. Although relaxed, Snot will take a swipe out of anyone who picks her up. Chicken, patiently waits for you to pick him up and scratch his belly.